near Perth. The things you learn from YouTube. and continents away from the straight-line recipient. where my country is from here. About the Author: Stephen Roger Powers started writing poetry almost twenty years ago to pass time in the middle of the night when he was too energized to sleep after coming off the stage in comedy clubs around the Midwest. He is the author of The Follower’s Tale and Hello, Stephen, both published by Salmon Poetry. Other work has appeared in 32 Poems, Shenandoah, The Southern Poetry Anthology Volume V: Georgia, Rabbit Ears: TV Poems, and Stone, River, Sky: An Anthology of Georgia Poems. He hasn’t done stand-up in a long time, but every once in a while he finds avenues for the performer he was born to be. He was an extra in Joyful Noise with Queen Latifah and Dolly Parton, and he can be seen if you know just where to look. This entry was posted in Stephen Roger Powers and tagged American Literature, Cliffs of Moher, Ireland, Montauk, O'Brien's Tower, Poetry, Stephen Roger Powers. Bookmark the permalink. 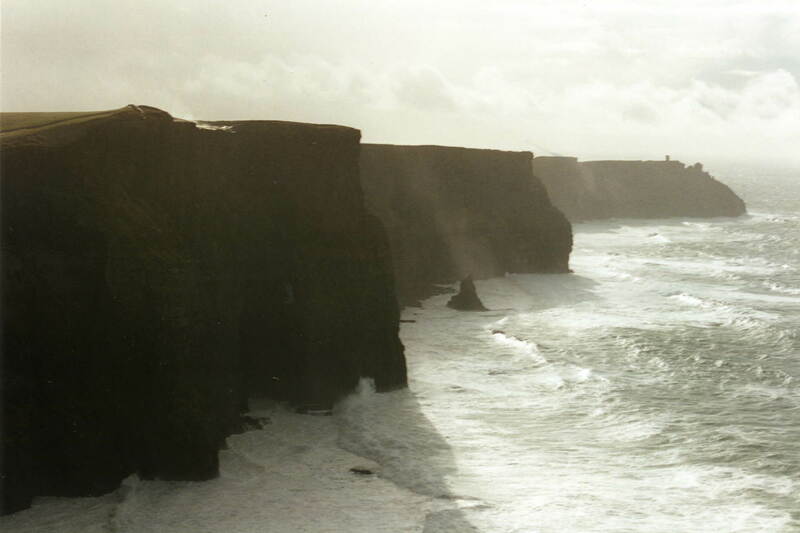 I feel as if I have been to Ireland…stood on the cliffs and launched a thousand questions to the sea. Thank you for sharing.